Wed, Feb 13, 2019, 11:59 pm SL Time, ColomboPage News Desk, Sri Lanka. Feb 13, Colombo: A high-profile delegation from the Office of High Commissioner for Human Rights (OHCHR) today held a meeting with Ports, Shipping and Southern Development Minister Sagala Ratnayaka on a wide range of matters including Sri Lanka's progress on UNHRC resolutions. Ratnayaka attended the meeting in his capacity as the Chief of Staff to Prime Minister Ranil Wickremesinghe. At the meeting, the two parties also focused on UN Human Rights Commissioner Michelle Bachelet's report on Sri Lanka which will be presented to the March session of the UN Human Rights Council, where Sri Lanka's progress on the recent UNHRC resolutions would be discussed by its member-nations. 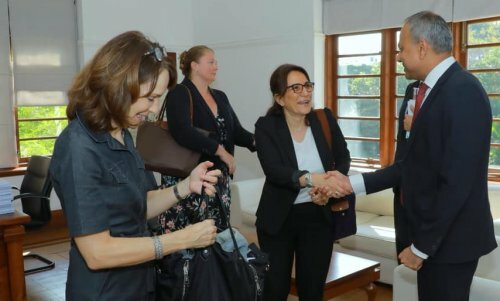 The OHCHR delegation is also expected to meet several senior members of the government and seek their views on Sri Lanka's current position with regard to UNHRC resolutions promoting reconciliation, accountability and human rights in Sri Lanka.